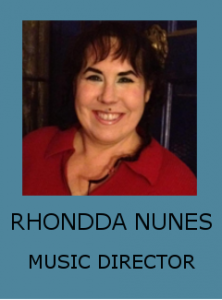 Rhondda Nunes was born and raised in Stockton, California studying piano and voice at an early age. At Franklin High she studied Jazz improvisation with renowned Jazz educator Mel Won and won numerous scholarships to college were she continued her studies with Max Simoncic at SJDC in music composition before venturing to UCLA to study film music composition with the late David Raksin. Receiving an offer for a Teaching Assistant position at the University of the Pacific she returned to Stockton to pursue a Master’s of Music degree in Music Composition and Music Theory studying at Pacific with the late Stan Beckler and Ronald Caviani. Ms. Nunes has won numerous awards in Music composition including the ASCAP+ grant (American Society of Authors, Composers, Artists and Producers) three years in a row; Two Stockton Arts Commission grants for her musical project devoted to original music “The Rhondda Nunes Collective” , an honorable mention for her song cycle “5 songs on texts by Emily Dickinson” and has been part of a 50-60’s band RB/X that has won “Best band in San Joaquin county” 5 years in a row as voted by the readers of The Record. Ms. Nunes also has a film score credit in IMDB ( the Internet Movie Data Base) for the 2005 Independent film “From the Outside In,” and is the sole living composer born and residing in Stockton, CA that has accomplished this. As the Music Director at Zion Lutheran Ms. Nunes wears many hats from composing and arranging music for service, bringing in talented performers to perform in service and booking musical events throughout the year; teaching neighborhood children to develop their musical skills and love and appreciation for music; as well as directing the choir and performing in service herself and on her principal instruments which includes piano, bass, organ and voice.